Compelling case studies can be extremely useful sales tools. They put your most valuable benefits on display, using convincing language that connects with the core concerns of your ideal prospects. Buyers love case studies. In fact, 78 percent of B2B buyers read them when researching an upcoming purchase. Why, then, do so many companies fail to create compelling case studies? Well, creating a convincing case study is hard. There’s a reason why experienced copywriters charge thousands of dollars for a single case study. There are some common frustrations involved in creating case studies. For instance, asking something extra of a valued client, like a request to interview them, can be uncomfortable. Also, finding the right copywriter who understands your industry and product can be difficult. It requires a unique skillset for a copywriter to interview clients and sum up relationships they aren’t familiar with. Like all great marketing content, an effective case study is a story. It’s a story of how your solution helped your client. The best case studies include many of the same beats you’d find in your favorite fiction book — the protagonist (the client in the case study) runs into several roadblocks before overcoming them with your help and reaching the ultimate goal. In this article, we’ll take a look at some of the best case studies from a variety of different industries, deep-diving into what makes them so effective. Once you’ve read this article, you’ll be able to craft highly effective case studies for your own business. What Makes an Effective Case Study? Before diving into examples of great case studies, it’s important that we define what makes a case study great. By and large, great case studies contain the same fundamentals as effective marketing — persuasive copywriting, great design, a relatable problem, and an effective solution. A Great Headline and Story. Effective copy always starts with a compelling headline. Just because case study copy is typically of the drier variety, doesn’t mean you shouldn’t try to grab the reader’s attention with a great headline. Great case studies tell compelling stories that connect problems to solutions and solutions to results. A Recognizable Brand. A case study about a brand your clients will recognize is powerful. It establishes trust and authority. Case studies about clients with impressive brand names will always be more effective, even if you have delivered more impressive results for other clients. A Relatable Problem. You want your prospects to read your case study and relate to the problem your client was having. The focus should be on creating case studies for your ideal clients. Naturally, the issues outlined in case studies should connect with the problems that your current clients run into. An Effective Solution. Once a problem was identified, how did your company help your client overcome the issue? Lots of case studies provide really vague answers. While you don’t want to write thousands of words outlining every piece of your solution, some specificity is important to help prospects understand how you can help them. Impressive Results. Were the results noteworthy? Case studies are meant to showcase impressive results and pique your prospect’s interest. But you also want to set reasonable expectations for a new customer. An in-depth case study should highlight why the result you delivered was possible in that situation. Now that we’ve outlined the qualities we are looking for in an effective case study, let’s dive into some examples. 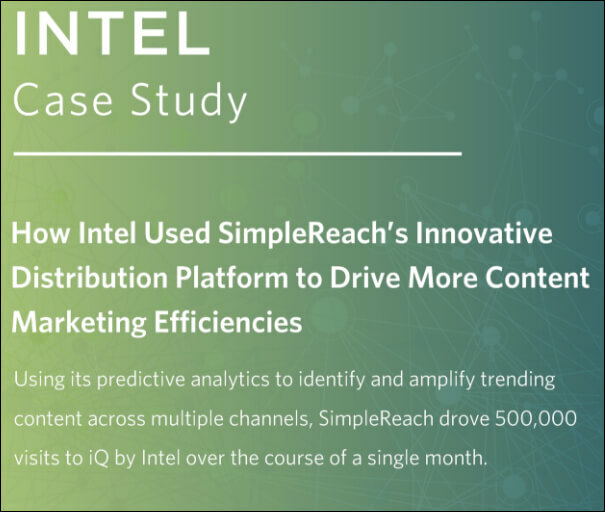 The first case study we’ll be looking at is SimpleReach’s Case Study covering their engagement with Intel. Let’s start by taking a look at the headline. As any marketer knows, you should never waste a headline. It will be the first and most important thing a prospect sees. A great case study title will ignite your prospect’s interest enough to make them want to learn more. The client company’s name. This is where the brand recognition we discussed earlier comes into play. A recognizable brand name grabs attention. The challenge that was solved. Did you help the client improve their advertising returns? Did you provide courses that helped them through restructuring their sales team? One applicable metric. Did you raise the client’s revenue by 10%? Did you increase their email subscription conversion rate by 3%? Give your reader something tangible to latch onto. You want your prospect to read your headline and place themselves in the shoes of your client. Who wouldn’t want to grow their revenue by X percent? Between the headline and sub-headline, they do an excellent job of showing who they helped, how they helped, and the results they were able to deliver. Intel is a huge name, so choosing them for a case study immediately carries weight. The use of the sub-headline to flesh out their results with stats (500,000 visits to iQ by Intel) is very effective. In this section, they start by explaining how important content is to Intel’s marketing strategy. 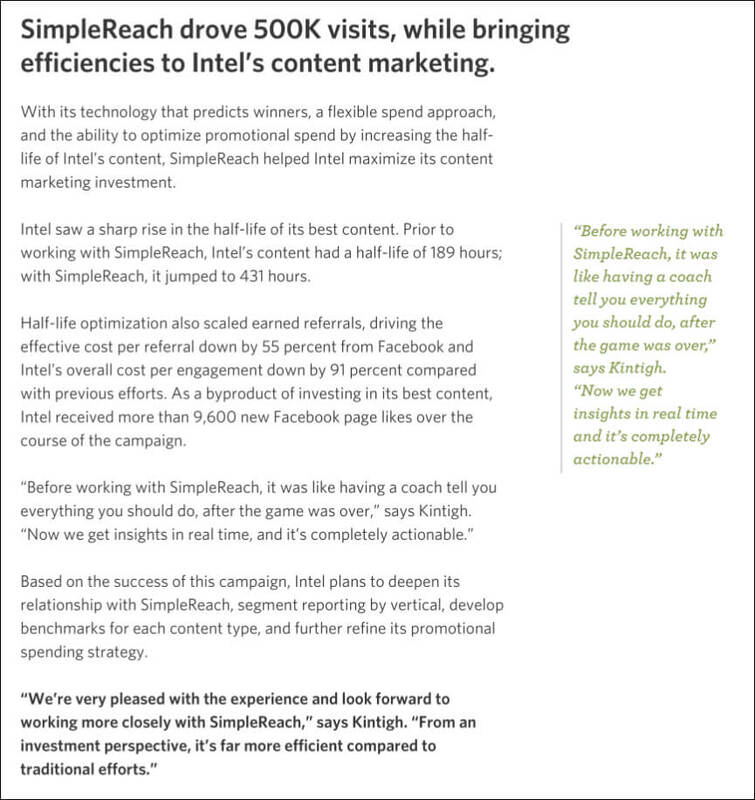 Then SimpleReach touches on the content marketing problem that Intel was having. 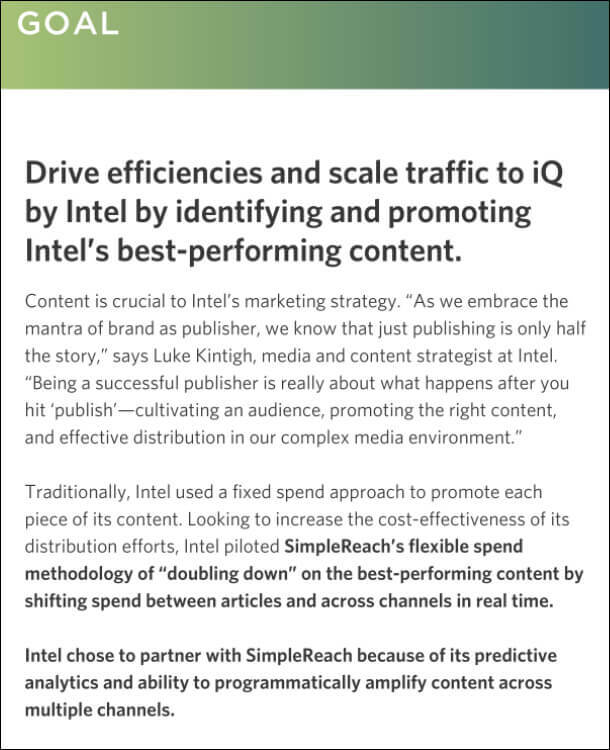 Intel was promoting all their content on a fixed spend basis, meaning they were giving pieces of content and channels equal budgetary focus. 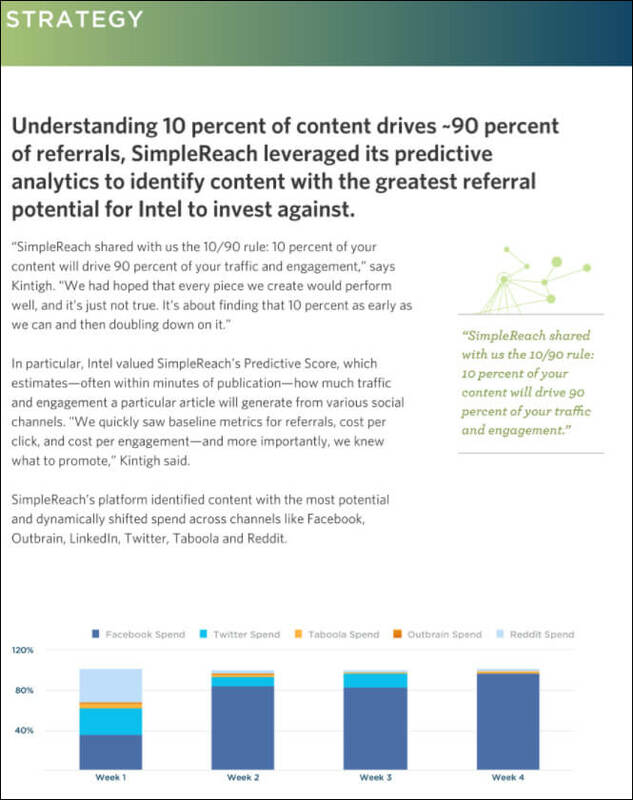 Using SimpleReach’s predictive analytics, they were able to reduce their cost-per-click while growing their budget. This serves as an excellent teaser to their “Strategy” and “Results” pages that follow it. This data provides insight into the end result in a visual way. Sprinkling metrics and individual results throughout a case study can be a great way to keep your readers engaged and drip feed the narrative to them as they go along. By including quotes in the right-side margins of each page, they make the most important points easy to find and internalize. A large percentage of readers will skim even the shortest case study. By making important information accessible, they improve their chances of catching the interest of the prospect and convincing them to read further. Here, they delve deeper into the changes they have teased throughout the case study. They begin by outlining their main philosophy for this engagement in both the headline and first paragraph — that 10 percent of the content you publish drives 90 percent of your engagement. In the second paragraph of this section, they outline one of the main benefits they provide to clients in their predictive system that estimates expected engagement figures through several social media channels. Just as in the “Goals” section, the “Strategy” section includes a data visualization at the bottom that expands upon what they have already shared. While the first graphic showed how they were able to help Intel decrease their cost-per-click, this graphic sheds more light on how they did that by showing how Intel’s channel budget shifted after they started working together. While SimpleReach did a good job of sprinkling data and graphics throughout the case study to slowly build the narrative, it’s on this page that they really dive into the results. They provide hard data on a variety of metrics including content half-life, total visits, cost per referral, cost per engagement, and Facebook engagement. By focusing heavily on several metrics on this page, they give themselves multiple chances to connect with the reader and speak to a KPI that they would also like to improve. Toward the bottom of the page, they include testimonial quotes from stakeholders at Intel. Ultimately, the client’s words play a huge role in how prospects view the engagement. You want them to visualize themselves enjoying similar results from having worked with your company. 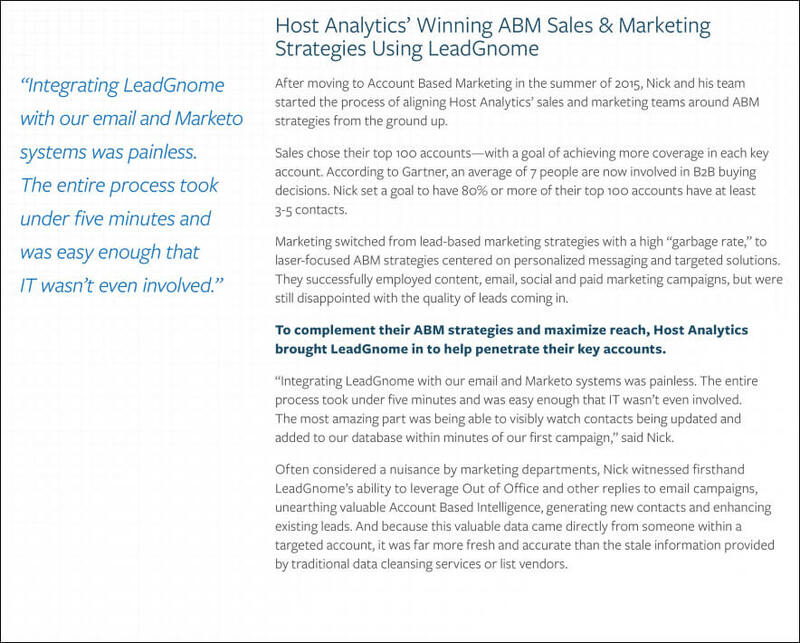 Our next example of an effective case study comes from LeadGnome’s case study covering their engagement with Host Analytics. This headline gives a very clear picture of who they helped, what they helped them achieve, and the measurable result it led to. It’s simple, but simplicity is powerful. While their introduction might run a little on the long side, providing a profile of the client you are covering can be useful because it allows the reader to draw comparisons with their own company. LeadGnome does an excellent job of giving an overview of Host Analytics and what they were trying to accomplish. 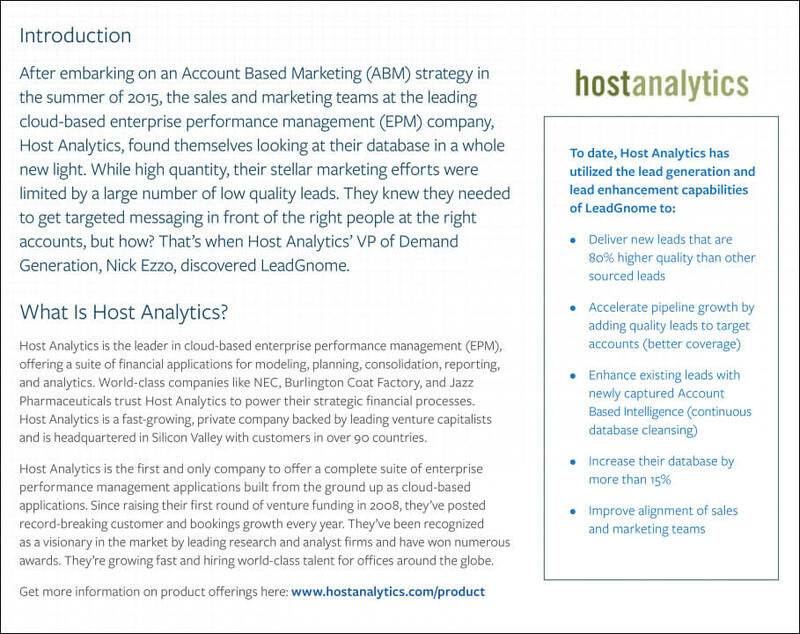 Take note of how the “Introduction” paragraph ends with the VP of Demand Generation at Host Analytics discovering LeadGnome. Showing the sequence of events that led a company to work with you is a subtle way to weave a narrative into your case study and keep your readers interested. LeadGnome also does something a little different on their first page than SimpleReach did on theirs. They provided a bulleted list of results on the right side. This is a great way to pique the interest of the reader. By teasing the results early, the reader will question how they were able to achieve those results, enticing them to keep reading. 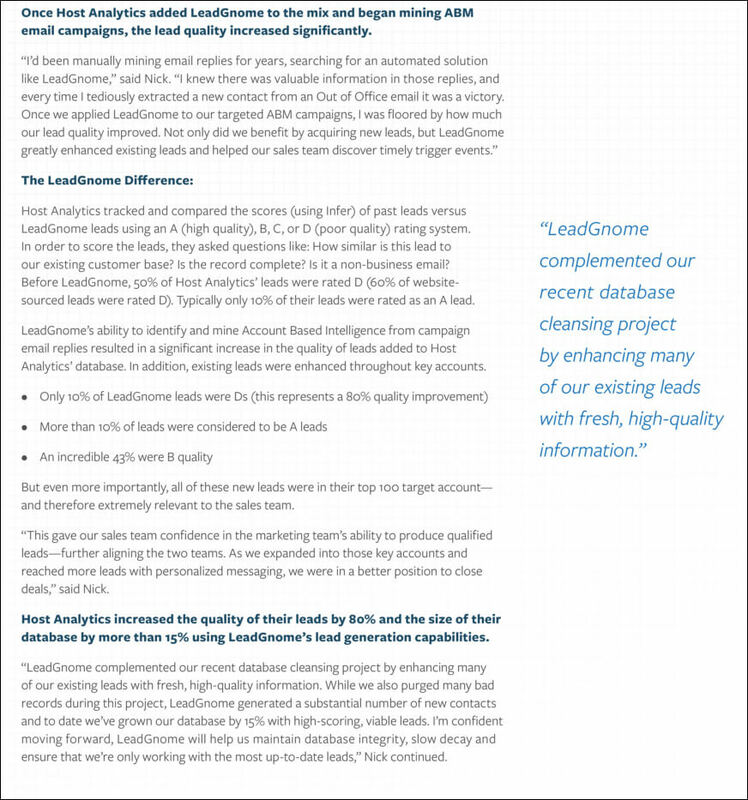 The second page of the LeadGnome case study dives into the goals and strategies used in their engagement. They continue building the story they began on the first page by detailing how they worked together to integrate LeadGnome into their current systems. The quote on the left side of the page highlights the most important tidbit they want to drive home — LeadGnome is exceptionally easy to integrate with other systems. They go to a lot of effort to dispel the specific objection that third-party teams are difficult to integrate with internal marketing teams. This page gets very direct regarding the problem and solution. The quote at the top spells out the issue — they were having success manually mining emails for data, but that approach couldn’t scale. Then in the “LeadGnome Difference” section, they dig into their system, how it helped, and the exact results they delivered. Always provide your results in a way that helps them stand out. Don’t bury them within a paragraph. In this example, they separated them into bulleted points in the middle of the page. Case studies that feature a lot of data won’t be able to highlight everything, so choose the 2-3 most important stats to highlight. The stats that you choose should align with the problems you highlighted at the beginning of the case study. Then they close out the page using testimonial quotes to provide more insight into how valuable the interaction had been for Host Analytics. 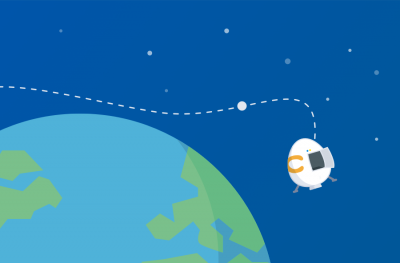 This case study from Bitly is another example of a great case study. We decided to include this case study because it is in a completely different style than the previous examples. It’s shorter, more visual, and highlights self-serve software rather than a more in-depth consulting service. Their approach here is also different than in the previous examples because they don’t name the client they are covering in the headline. They do, however, mention the type of company they helped (eCommerce) and the issue they helped them with (omnichannel). They also use the bottom of the page to help readers understand their service and mention that they work with some of the largest companies in the world. While it might have been a good idea to mention some brands by name in this section, stating that they’ve worked with the top brands does help to build trust and convey authority. 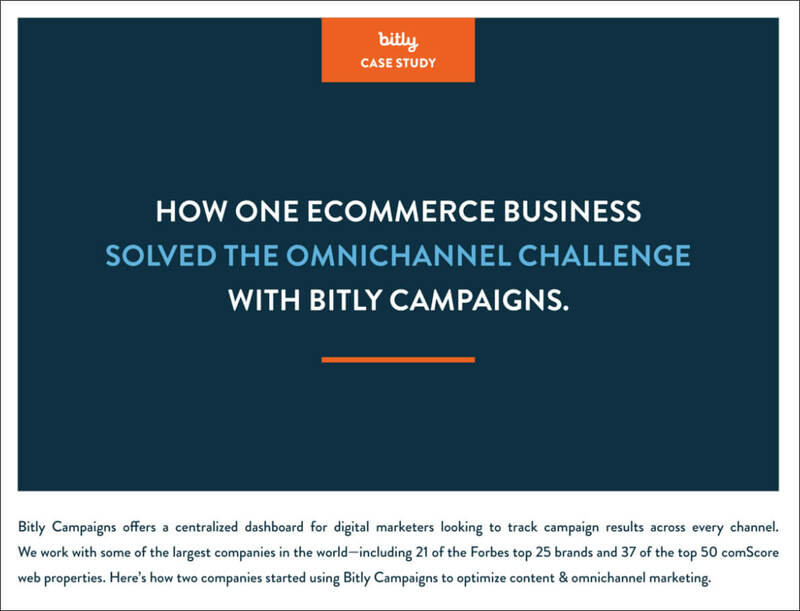 Here Bitly outlines some of the common omnichannel problems they can help eCommerce companies solve. They place a lot of focus on how Bitly takes a complicated problem and simplifies it. On the right side of the page, they provide some key statistics from Forrester. 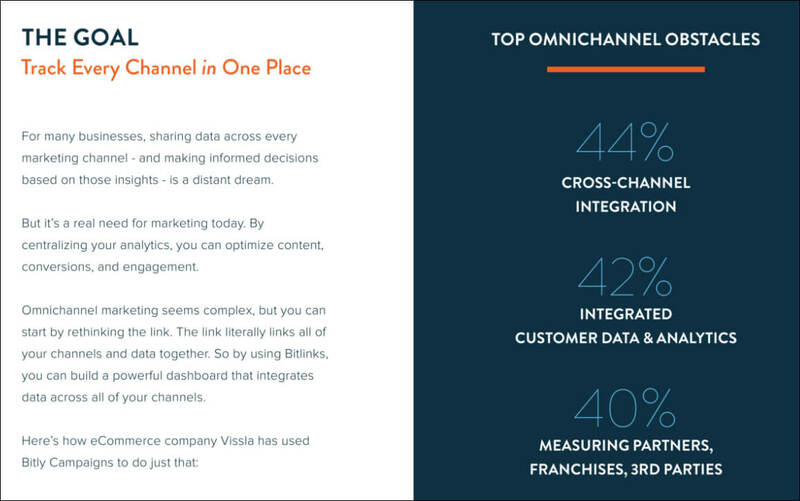 These stats aren’t specific to their interaction with Vissla, but speak to how widespread the omnichannel tracking and integration problem is for eCommerce companies. There is a good chance that prospects who read this case study will be struggling with one or more of these issues internally. Because Bitly Campaigns is a self-serve software solution with little involvement required from Bitly staff, they make this a big focus of the case study as a whole. This page in particular positions their platform as a simple solution. They break the process down into four easy steps and dedicate an entire page to highlighting this fact. 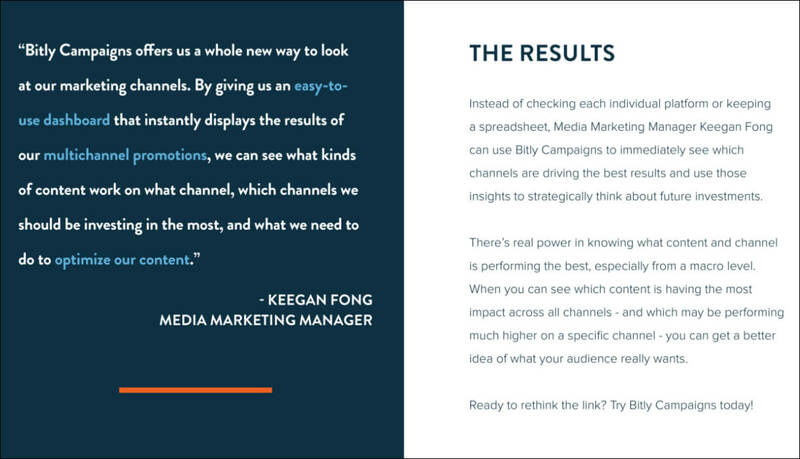 Bitly’s “Results” page doesn’t include statistical business outcomes and instead focuses on process benefits. 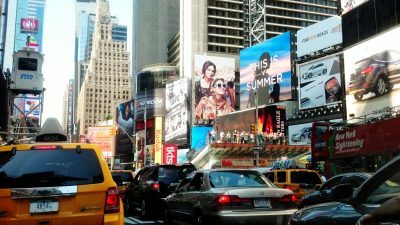 They have laser-focused this case study to address a specific pain point — the complexity of omnichannel content platforms. By helping their clients identify which channels are performing best for their content, the real benefit comes from the time and hassle saved. 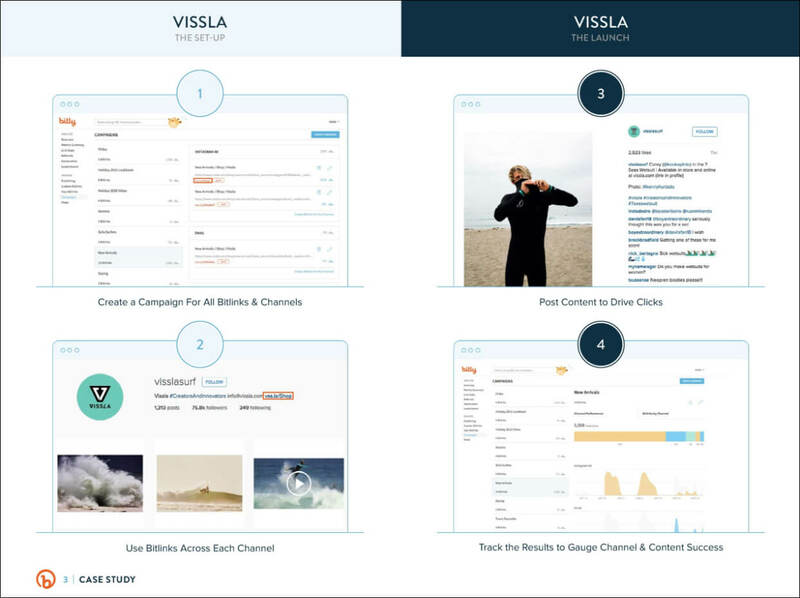 The quote on the left-hand side of the page again highlights how easy their system is to use while it spells out how their system helped solve the omnichannel issues that Vissla was experiencing. Bitly’s case study isn’t as specific as the previous examples, but it still does a great job of highlighting the pain points their platform addresses. By dedicating a full page of the case study to explain how their platform works, they further drive home that point. With these examples in mind, we also want to highlight that the most important part of using case studies isn’t creating them, but rather what you do with them once they are put together. You don’t want to pay top dollar for an excellent case study just to throw it up on your website and hope your prospects are able to find it on their own. A great case study is an exceptionally effective tool for persuasion. But if you never get it in front of potential customers, what good is it? You should include case studies throughout the buyer’s journey. Turn it into sales collateral. A case study is an effective tool for any sales team. 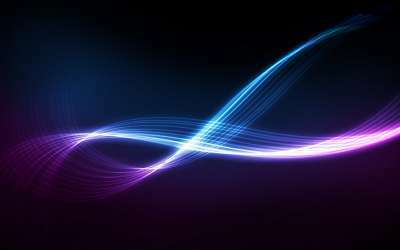 It speaks to the applicability of your solution in specific industries. It gives prospects an idea of how your product might work for them by highlighting how other similar companies have used your solution to better their own businesses. Email it to prospects in the nurturing process. If someone is on the fence, a case study can go a long way toward convincing them to try your product. Build your case study directly into your automated nurturing process to extend its life and get more out of your investment. Hand it out at events and conferences. If you hand out an information packet at industry events, including a case study is always a great idea. Print out a professional-looking physical copy of your case study and hand it out directly from your booth. Use figures and quotes in other content. The figures and client quotes that you use in your case study will have useful applications outside of the case study itself. Repurpose some of the content from your case study in blog posts, email newsletters, and social media updates to maximize your investment. Case studies that are published on a “Resources” page are still useful, but finding ways to extend their usefulness is necessary for maximizing your ROI. Great case studies can help your sales and marketing teams close new customers for years after they are published. But for them to be effective, the case studies have to be put together well and help your prospects see themselves in the shoes of the clients the case studies highlight. The examples in this article all take different approaches to case study style and design, but all do a great job of highlighting specific benefits of their product or service. A great case study helps readers envision themselves working with your company and enjoying the same results as the client in the case study. Creating a case study for each of your customer personas is an excellent way to arm your sales team with effective marketing collateral that drives sales. About the Author: Ryan Bozeman is an experienced copywriter and content strategist from Seattle, WA. He specializes in helping SaaS and marketing companies design and execute content marketing strategies that educate prospects and grow sales.